When growing cold hardy bamboos it is important to protect your plants from freezing. Keeping your bamboo healthy through the winter will bolster strong spring growth. When bamboo freezes this stops the flow of fluid and nutrients causing significant harm. Adequate insulation is key in colder climates, when planting in a container extra effort is necessary. During the establishment period (First 1-3 years) is when your bamboo is most vulnerable. Most bamboo once established can weather the winter season without any worries. 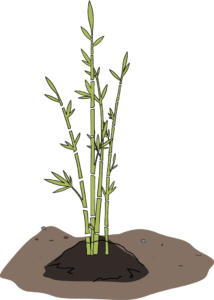 During the first few years your bamboo is just starting to establish a full colony of underground rhizomes. As your bamboo accrues more biomass, it will stay better insulated through the winter naturally. Above ground containers do not benefit from the insulation the earth provides, further precautions are required in this case. It is key to plant into a large container in order to provide more insulation for the rhizomes. 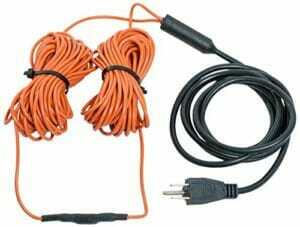 Soil warming cables will heat the soil and stop freezing. When the container is able to freeze, nutrient transfer is impeded and winds can dedicate foliage and cause permanent damage easier. Ground temperatures are typically warmer than than air which makes it less conducive to freezing. In-Ground plantings generally have a much larger root mass that can endure harsher conditions. Applying heavy mulch will further prevent drying out and temperature loss. Covering your plants with “mini” greenhouse tents are ok, however this will block rain from entering, so watering will be necessary. Cutting back canes will not be any benefit to the health of the plant. Doing so will only reduce productivity next spring. Any type of mulch for this application is fine. Bamboo is not picky and just wants to be warm. Even leaves and pine-straw will do great. Anti-desiccant sprays have been known to work, but is not a substitution for our recommendations. If you bamboo is covered in Ice/Snow it is best to leave it alone and wait for it to melt. Bamboo is very flexible, but shaking the canes at this stage will likely cause a break. With minimal effort your bamboo will be just fine through the winter. Our bamboo can be planted in most of the USA from zones 5a to 10+. Shop our Cold Hardy Bamboo to start growing your own! Not sure if you live in the right climate zone? Use our brand new Bamboo Finder! Bamboo can provide a lush evergreen privacy screen or hedge in a very short time if planted correctly. First, species selection is critical. Species should be selected based upon climate zone, desired appearance and height. Make sure you get a species cold hardy enough for your climate zone so that it will be evergreen and you can enjoy privacy year around. There are many species for climate zones 5 and warmer that will give great screening. Soil can have an impact too. Most temperate bamboo will survive in range of soil conditions from clay to sand. This will really only effect the bamboo ability to spread. Most bamboo if you asked them (don’t let anybody see you do this) prefer PH neutral to acidic sandy loams. Sunlight conditions vary great from deep shade to full sun. Most all of the good screening bamboos (the Phyllostachys genus) is tolerant of all sunlight condition. As long as there is 4+ hours of filtered sun or better, bamboo can grow. The more sun, the faster the growth and development of the privacy screen. Sunny sites require more water because of evaporation and feeding the higher growth rate of bamboo. One division of bamboo will start a grove or screen over time. However, if you want a privacy screen fast, I recommend planting 3 gallon sizes 3 to 5 feet apart, plant 2 gallon sizes 1 to 3 feet apart. This will hopefully allow you to have a good screen in three years. There are a lot of factors such as water, sunlight, and climate zones that speeds up or slows down the process. Three years is about the average on this spacing, closer planting will allow you to screen or develop your grove faster. You cannot over plant bamboo. Bamboo grows a little different than most plants. The bamboo that you get initially never grows vertically again. It has babies that are taller, that has babies that are taller. Every generation should be taller that the previous year’s shoots. The intriguing aspect is that each year’s growth emerges and grows to it complete height in 60-90 days. They spread as they produce larger growth, filling in and providing a screen. This link will help you learn how bamboo grows. It will give you an idea of what kind of growth to expect from your planting. It also goes over some methods of controlling bamboo and how to keep your bamboo healthy. It is a lot of information, but well worth your time. Finally, I will share with you a tip that will really help your bamboo screen develop quickly. Watering is the key. Especially during the establishment period. Bamboo should be watered heavily but make sure that you allow the soil time to dry between watering cycles. This can vary greatly between soil conditions so you will have to monitor it at first until you find the correct amount and schedule. The method of delivery can be very beneficial too. Soaker hoses are great because bamboo rhizomes tend to follow the path of least resistance. A soaker hose tends to help your bamboo screen develop much faster because it encourages growth along your screening axis. For best results align the soaker hose directly where you want your bamboo screen to grow and coil it around initial plantings to provide the most water to the plants. With these elements in mind, developing a bamboo screen is easy and fast. In just a couple of years, you will be able to watch your screen grow and enjoy your privacy.